Today enterprises generate huge volumes of data in various formats. Managing this "Big Data" and extracting value out of it is a big challenge for any organization. 3RS can help meet this challenge by providing expert consulting in Big Data from idea conception to solution delivery. We provide consulting and implementation services for leveraging your Big Data stores to generate actionable business intelligence. Our Big Data Analytics practice includes data exploration, statistical modeling, predictive analysis, unstructured data analysis and advanced data visualization. If you already have BI and Data Warehousing systems, we can help you customize and/or enhance them to adapt to the Big Data paradigm with minimal incremental cost and effort. 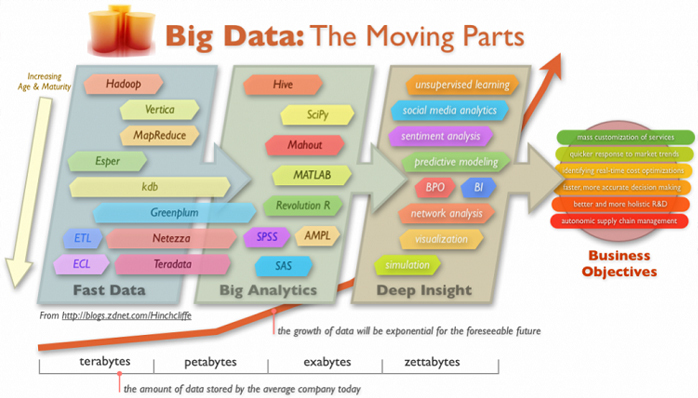 ETL usingMapReduce, Perl, Hive, Pig, Python, HBase, Oozie, and many other Big Data technologies.